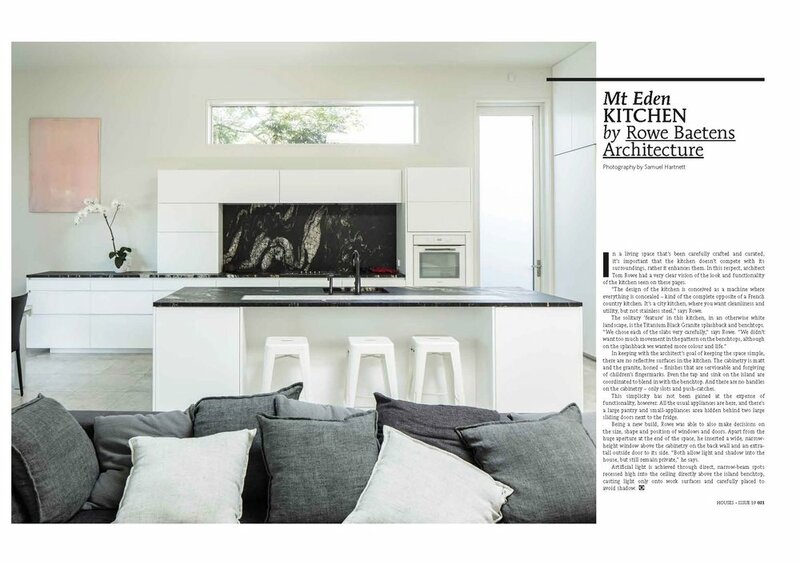 Extract: “"In keeping with the architect’s goal of keeping the space simple, there are no reflective surfaces in the kitchen. The cabinetry is matt and the granite, honed finishes that are serviceable and forgiving of children’s fingermarks. This simplicity has not been gained at the expense of functionality, however. All the usual appliances are here, and there’s a large pantry and small appliances area hidden behind two large sliding doors next to the fridge… Artificial light is achieved through direct, narrow-beam spots recessed high into the ceiling directly above the island bench-top, casting light only onto work surfaces and carefully placed to avoid shadow." The house is cut into an incredibly steep site; a considerable component of the project was to being and sculpt the mass of the landscape to create an even grade and form a landscaped terrace under an existing pohutakawa tree to the north of the house.